Many Big Bend anglers are convinced that plastic (can you say “fake”?) shrimp are the equal of live shrimp when it comes to fishing on our coastal grass flats. It used to be that artificial shrimp looked nothing like the real thing, but in recent years they’ve almost reached a degree of hyper-reality! D.O.A. 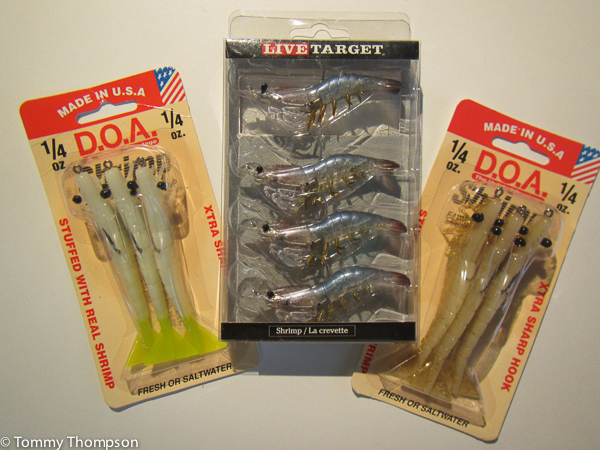 Lures’ 3-inch shrimp (in “glow”) is a good choice, as is the Live Target 3-inch slow-sinking white shrimp. Either of these lures weights 1/4 ounce and are easy to cast using light to medium spinning tackle. Many anglers use 2000 to 2500 class reels spooled with 10-pound test braided line and 20 to 25-pound test invisible fluorocarbon leader. Others, many of whom are not used to making hundreds of casts in a day, rely on popping corks and rig their shrimp so that they just barely skim the grass tops under the cork. There are several advantages to using artificial shrimp. One, pinfish don’t eat them up before the game fish have a chance to attack. Second, in the long run they’re cheaper than live shrimp. And finally, your hands don’t stink at the end of the day!